This Easy Balsamic Strawberry Vinaigrette Recipe is going to blow away your mind with it’s slightly tart and fruity flavours and guess what? It’s super healthy too 🙂 Dress up your salad with this easy recipe this summers and fall in love with your salads. Here is how to make Strawberry Vinaigrette Salad Dressing Recipe. 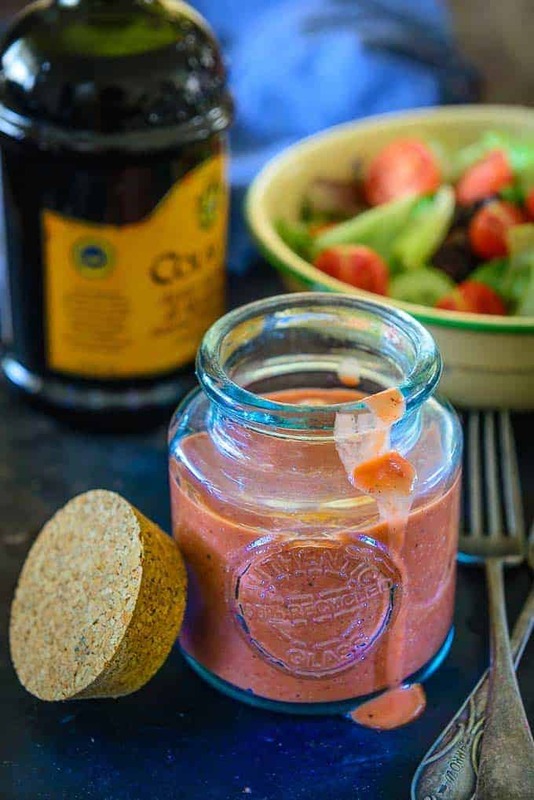 A fresh punch of fruit that goes with all your favourite salads, Easy Balsamic Strawberry Vinaigrette is a low cal, homemade salad dressing that will make you fall in love with your salads all over again. Made from farm fresh strawberries that are blend until smooth, this vinaigrette recipe is simple to make as well. The most popular perception in most of our minds is that though salads are incredibly healthy and enriching, still they aren’t so delicious and satiating. Right? But, what if I tell you that salads can be decadent and soul satiating. Don’t believe me yet? Then wait till you toss those fresh greens and more in Strawberry Vinaigrette Dressing Recipe. Vinaigrette is a salad dressing that is prepared by mixing Extra Virgin Olive Oil with acidic ingredients like vinegar. Fruits like lemon, basil, strawberry et al can be added to it to give it a unique flavour. Its flavours can be enhanced by adding a dash of salt and pepper. Being a salad lover, it was obvious for me to try such dressings and some of my tested, delicious recipes include Basil Vinaigrette, Balsamic Vinaigrette and this delicious Strawberry Balsamic Vinaigrette. Guess what? All of them are lip-smacking! Though the store bought Strawberry Vinaigrette Salad Dressing could be your preference, I always recommend making these easy peasy dressings at home because it stays authentic and pure that way, folks! After all, you could handpick strawberries and other ingredients all by yourself, no? And with it getting made in just one smooth blend of fresh strawberry, extra virgin olive oil, honey, balsamic vinegar, salt and pepper, Balsamic Strawberry Vinaigrette Recipe is for sure the easiest dressing to devour with spinach salad or any other of your choice. Now that the summer sun is all set to dawn upon us, I definitely urge you to keep a jar of this Vinaigrette to make salads on the go. And if you also crave for a fresh beverage along with the strawberry flavoured salad then do make Watermelon Ginger Juice as well. How long does Strawberry Vinaigrette Dressing last? It’s best to make this dressing fresh. You can refrigerate it for maximum of 3 days if you made an excess of it. What does Strawberry Vinaigrette Salad Dressing taste like? Strawberry Vinaigrette has a very interesting flavour profile. It is slightly sweet and tart from the strawberries, acidic from the balsamic vinegar and their is a hint of salt balancing out the whole thing. It’s a perfect dressing to go with any salad. Fruity, tangy and subtly sweet, this Easy Balsamic Strawberry Vinaigrette is that one of its kind dressing that lends all the fine flavours to your salads, try it super soon! 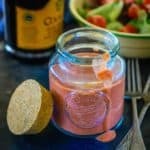 How to make Strawberry Vinaigrette from Jam? When fresh strawberries are not available and you feel like making this vinaigrette, just add 2 tbsp of strawberry jam in place of strawberries and skip the honey. 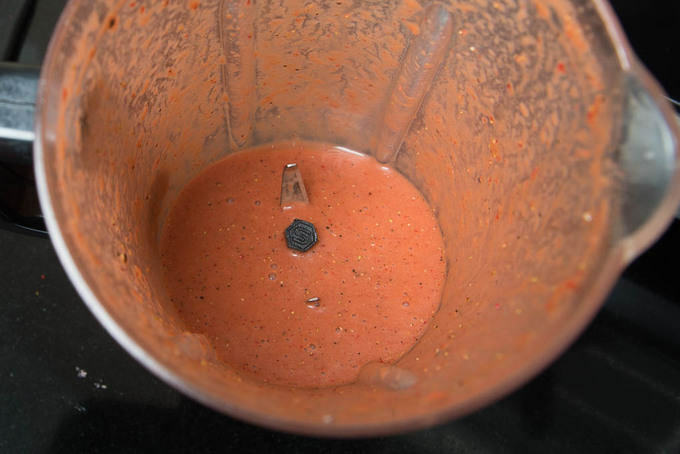 Keep the rest of the process same and you will get a great vinaigrette in no time. Oil – In this particular recipe, I have used Extra Virgin Olive Oil but you can definitely use any good cold pressed oil of your choice. Try experimenting with flax seed oil, grape seed oil or even sesame oil. 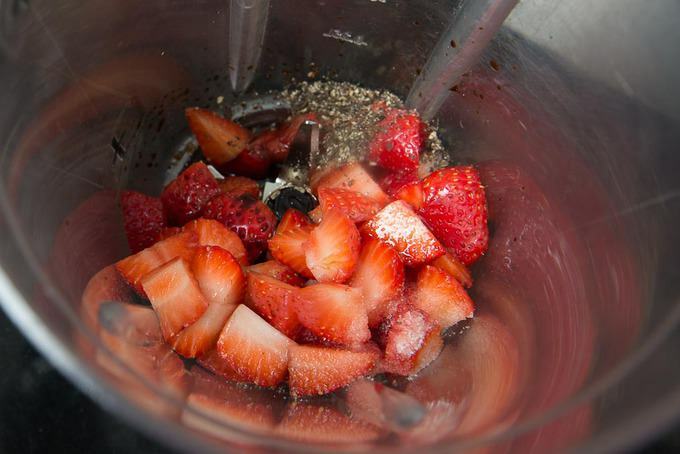 Acid – Balsamic Vinegar makes a great pair with strawberries and that is why I have used it in this recipe. But feel free to use vinegars like apple cider vinegar, red wine vinegar, rice vinegar etc. Citrus juice along with vinegars also adds a nice flavour profile to vinaigrettes and you must definitely explore adding them. Seasoning – I have kept the seasoning basic to salt and pepper. Go ahead and try adding garlic, herbs, dijon mustard etc. Play with the seasonings for a new flavour profile each time you make this recipe. Easy Balsamic Strawberry Vinaigrette Recipe is going to blow away your mind with it's slightly tart and fruity flavours and guess what? It's super healthy too . Transfer in a glass jar. Use over your favourite salad.